Amazon India selling Avani MetroBuzz A-1 Kids Table Chair Set Rs. 699 only at Lowest and best price. .You can follow the below steps to buy this product at their deal price.Keep Visiting dealsheaven.in for more Best offers ,hot online deals, promo code, coupons and discount . Light-weight & convenient to carry; Item Weight: 3 Kg; Product Dimensions: 70 x 60 x 40 cm; Material: wood & Practical and fun for kid's bedrooms. 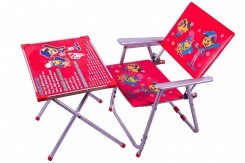 How to buy Avani MetroBuzz A-1 Kids Table Chair Set ?